A cause to celebrate ! 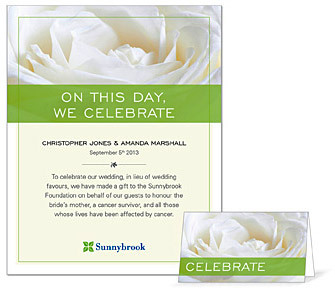 Sunnybrook Foundation offers a wedding recognition program that allows you to make a tax deductible donation in honour of your guests. Cards for each place setting at your wedding reception with the option to provide a personal message to guests. A personalized certificate to display on your gift table. After placing your order a donor service representative will contact you for customization. Order your package today! Call 416-480-4483. *For more information about the eligible amount of your tax receipt, please visit Canada Revenue Agency’s information on split receipting.